From Dallas – Texas we bring THORN! 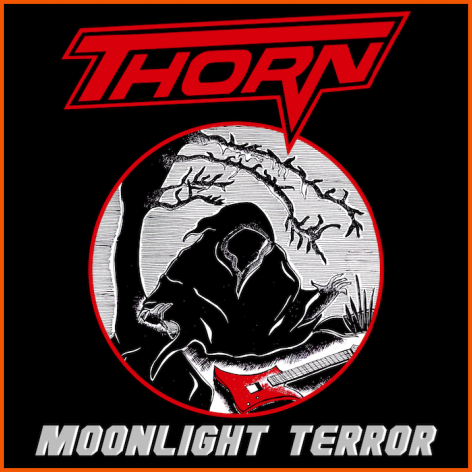 Their 1987 cassette album ‘MOONLIGHT TERROR’ has been on our regular playlist for some time now and fortunately we have the opportunity to do a more-than-deserved CD release of this great studio recording! Get ready for some introspective Texas Metal, like a subtle version of Mox Nix or Tyton! Includes the songs from the ‘Moonlight Terror’ cassette album, plus an unreleased studio song and live performance from the 2014 reunion concert, in a total of 10 songs. Comes with a 12 page booklet with song lyrics, band biography and rare photos. Limited to 500 copies.